New York City, 2001. 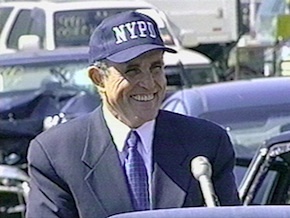 Rudy Giuliani's reign as mayor is almost over. Crime has plummeted, the streets are safe, but many feel the city has lost its soul. Then comes September 11th. Out of the city's gravest crisis New York's most divisive and combative figure emerges as an international symbol of leadership and unity. 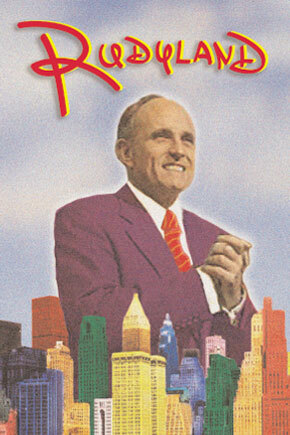 RUDYLAND is an irreverent, unauthorized documentary exploring New York's roller-coaster relationship with its controversial and now-celebrated former mayor. Narrated by Susan Sarandon. RUDYLAND is Matthew Carnahan's first feature documentary. BLACK CIRCLE BOYS, Matthew Carnahan's feature film writing/directing debut, was an official selection at the 1997 SUNDANCE FILM FESTIVAL and the 1997 SEATTLE FILM FESTIVAL and premiered on HBO. Mr. Carnahan also created and served as Supervising Producer of the Emmy Award-winning TRINITY, which premiered on NBC in October of 1998, executive produced by ER's John Wells. His first film, MAILMAN, premiered at the 1996 SUNDANCE FILM FESTIVAL, also showed at Montreal, British, Aspen, Atlanta, Turin, South by Southwest, USA and many others, and was purchased by Bravo and the Independent Film Channel. Matthew's plays include DIARY FROM AVENUE B in Dublin, Belfast and New York's Theatre Row; SALAD DAYS and THE ELEPHANT TRAINER'S APPRENTICE at the Westbeth in New York; SNAP and MAILMAN (writer/director, with Kevin Bacon and Kyra Sedgwick) and ROAD WORK (Judith Ivey, Joanne Woodward) at the Actors Studio, NYC; and VELVET ELVIS at the River Arts Repertory, directed by Joanne Woodward. Matthew was also involved in preproduction on THE FUGITIVE, the CBS weekly drama.